I’ve been doing digital graphic design for years, for my own, personal enjoyment. Losing yourself in the stages of an artwork is a great way to turn off the mind machine for a little while, not think about things that bother you, and simply empty your head. Usually, what I did were only small pieces; like a custom cover for a playlist (mixtapes may have gone digital, but they’re not dead). Earlier this year, I got inspired to do something completely new, though. Part of the inspiration came from the amazing Doctor Who posters by British designer Stuart Manning (separate post on that to follow). Part of the inspiration came from some artworks by Shepard Fairey of Andre the Giant Has a Posse and Obama Hope poster fame. And, yes, let me just mention: Fairey isn’t an entirely uncontroversial figure in terms of the originality of some of his pieces. He has been accused of plagiarising other people’s art on a number of occasions, and there are pretty strong cases against him. Needless to say, that’s never cool. But that doesn’t change the fact that some of his pieces look pretty cool. Of course it does help that I’m a sucker for propaganda style artworks, retro graphics, and street art in general. 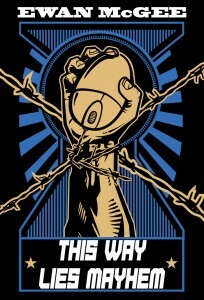 The cover of THIS WAY LIES MAYHEM speaks volumes of my likes (designed by the wonderful Rhonda Zayas). So I set out to create something I had never done before. Artworks, large in scale – at least larger than anything I had done before – in print quality. In case I ever want to print some of them to decorate the walls (especially now at the new place). I started doing more intricate designs, too. And I experimented with a few techniques I had previously not used a lot – some not at all. 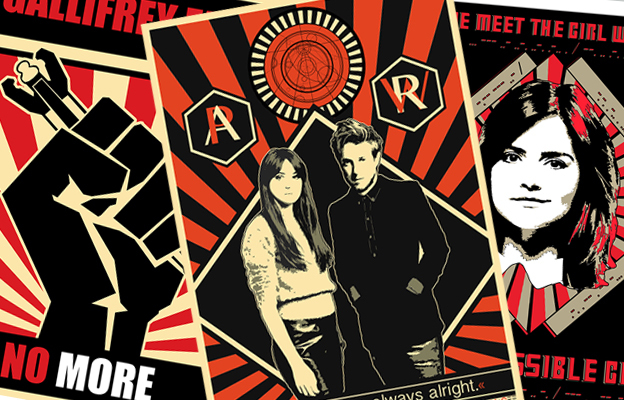 The first results were two batches of Doctor Who-themed “posters”, thanks to the Stuart Manning influence. Here is a gallery of these first two batches combined. More to follow; possibly some more Doctor Who pieces, definitely in some other categories. You can also view the pieces individually through the design section of the website. The artworks are all non-commercial, but of course you should feel free to share the links if you dig them.